Despite the absurd amount of money you'd happily pay to climb into a giant tub of Nutella, such a product sadly does not exist. But a new restaurant billed as the world's first official Nutella cafe may get you pretty damn close to the full-body chocolate and hazelnut immersion of your dreams. 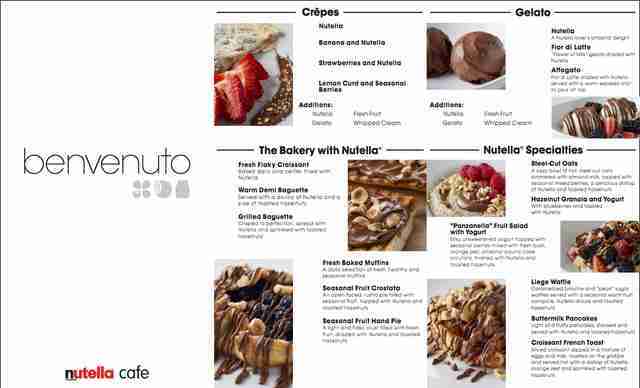 Nutella's parent company, Ferrero, revealed details about the eatery -- simply dubbed the Nutella Cafe -- in an announcement on Tuesday. 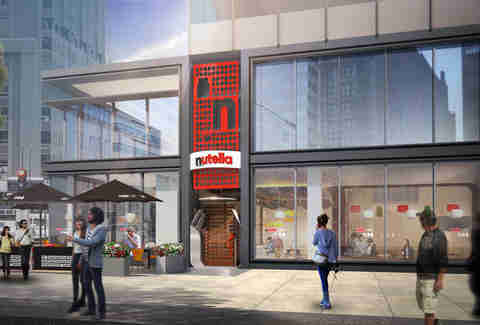 Just as its name suggests, the cafe will serve almost nothing but Nutella or foods made with Nutella when it opens near Chicago's Millennium Park on Wednesday, May 31, at 10am. The interior is even designed to look like you've stepped inside of a giant Nutella jar, complete with chocolate-like ripple fixtures across the ceiling, according to a report by the Chicago Tribune. 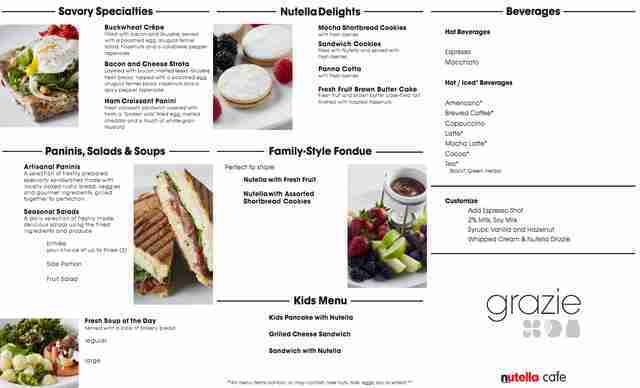 The extensive menu (shown below) includes a sugar coma-inducing array of Nutella dishes, including flaky Nutella croissants, Nutella gelato, Nutella Liege Waffles, and even family-style servings of Nutella fondue. A Nutella-covered grilled baguette is basically the cafe's fancy take on your usual Nutella toast. You can also order savory, non-Nutella foods like paninis, soups, and salads -- that is, if you want to be the person who goes to the Nutella Cafe and orders a damn sandwich. The coffee menu oddly doesn't include Nutella besides an optional Nutella drizzle and whipped cream topping. Of course, you can already experience Nutella overload at Eataly NYC's Nutella bar, the Nutella counter at Eataly Chicago, and an unofficial Nutella cafe in Australia, but Ferrero has billed the two-level restaurant as the first permanent, standalone Nutella restaurant in the world. Located at the corner of Michigan Avenue and Lake Street (151 N. Michigan Ave.), the cafe is right in the middle of the city's high-traffic tourist district, so you can safely expect chocolate-induced chaos and crowding when the place opens its doors. In fact, the company said it'll give one free menu item and other "special surprises" to the first 400 people who line up for the grand opening. You might as well start lining up now. Tony Merevick is Cities News Editor at Thrillist and just realized this is walking distance from where he used to live and work. Send news tips to news@thrillist.com and follow him on Twitter @tonymerevick.